I always wanted a sister.So did my mum.Unfortunately all either of us got were smelly little brothers so I was delighted that I got to give Mini a sister as I think there’s something really special about the relationship between sisters. It’s been six weeks now since Mini Mini came to live with us. Mini has taken to her new housemate both positively and negatively. There has also been a little bit of regression in her behaviour-wanting to be carried upstairs like a baby,screaming to get attention.Hopefully this will pass as she finds her place in the family again.It must be such an adjustment,having been the undivided centre of attention for so long. There is a bit of the green eyed monster at play too.Particularly with Papa,less so with me.If he has Mini Mini in his arms,Mini demands to be lifted up too. She is also quite good at repositioning Mini Mini’s soother should it be accidentally expelled from her wee mouth and will give her toy bottles to drink from too,just like a real life dolly, which I guess for her, is what her sister is. I can’t wait til Mini Mini gets a bit bigger and the two start to interact more.That ll be the start of some adventures for sure! Watching them interact is the greatest feeling! And I bet you'll see that Mini gets smiles from the baby before anyone else does! Aw happy days. I'm sure they will be great friends in years to come. I remember my eldest was thrilled when her brother arrived, but after a time she became a bit fed up. 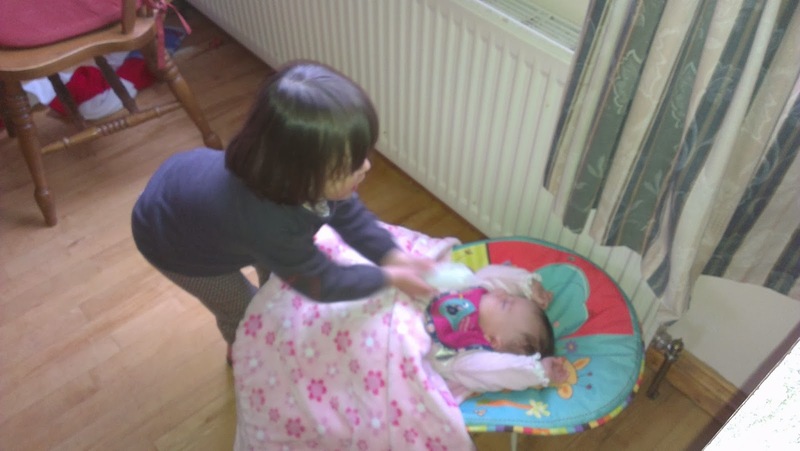 One day, when he was about 6weeks and she was 3, I went into the sitting room to discover her carrying him, as she wanted to “put him away somewhere”. Sadly when she saw me she dropped him and ran! He was fine thank goodness, didn't even cry. Looking so forward to sister smiles! Yes, I always thought how would I be able to love another child as much as I do Mini,but the love just multiples with more kids! Yes I do hope so! Yes, it's definitely a big adjustment for a little person to make! Oh gosh!Mini has tried lifting her sister up but she doesn't quite have the strength for it luckily for us!